Everyone knew it was coming. There really was no other choice. But the "what could have been" still looms gigantically large nevertheless. 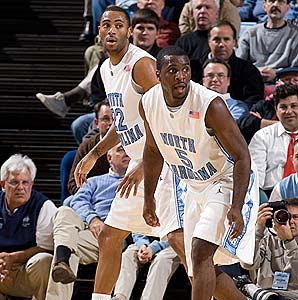 The Tarheels' Ty Lawson and Dwayne Ellington declared for the NBA draft today, thus ending their North Carolina basketball careers as well as any national title talks in Chapel Hill at least for now. Lawson will most certainly be a first round selection, but the jury is still out on Ellington as far as that initial round is concerned. Regardless of when they are selected, they both will have long, lucrative, and successful pro careers. It was indeed time for them to go. But there could have been another banner in the rafters of the Dean Dome next year if they had chosen to finish out their college careers. Ah, the things dreams are made of.